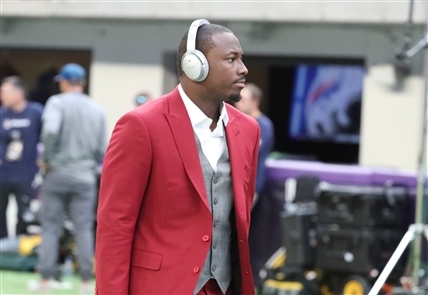 During an appearance Wednesday on ESPN's 'First Take,' Bills running back LeSean McCoy issued his strongest denial to date of having any involvement with an alleged home invasion that left his ex-girlfriend bloodied and bruised last summer at a house he owns outside Atlanta. "It was a tough year. It really was, especially for myself. You talk about the age, but I can still play. Since I’ve been on the Bills, I’ve been a Pro Bowler. Not no alternate and all this getting picked because somebody didn’t want to play." "Our best lineman, Richie Incognito, he kind of retired due to a contract situation. I think our biggest puzzle to our offensive line, Eric Wood, he had a neck injury, he retired. That was two veterans, and then we traded Cordy Glenn, who’s a pretty good left tackle, so that’s three veteran guys with experience that leave. People think because of my resume and how good I’ve done in my career, that I can just turn on and off. It’s not like that. I didn’t play well this year, also." "But the good thing is, I’ll bounce back. I always do. I think the guys in the front office with Sean McDermott and Brandon Beane, they’ll get the right guys. We’re not far at all. I’ve been a dog since I been 8 years old, man. So I’ll bounce back, and then we’ll have this same talk next year. Hopefully we’ll be in the (Super) Bowl and playoffs, making some noise." Special teams breakdown: New coordinator Heath Farwell aims to bring energy and passion to the job, Mark Gaughan writes. He's tasked with reviving a special teams unit that ranked 31st in the NFL this past season in an analysis of 22 different categories. UB's Anthony Johnson on cusp of continuing family tradition in NFL: Johnson has three cousins who have reached the NFL — Houston Texans Pro Bowl defensive end Jadeveon Clowney, Texans cornerback Johnathan Joseph, and former Bills safety Jonathan Meeks. There’s no doubt the 6-foot-2, 211-pound Johnson is going to join them, Gaughan reports from the Senior Bowl in Mobile, Ala.
More Senior Bowl coverage: Bills GM Brandon Beane is feeling less stress this year now that he no longer needs to find a franchise quarterback. ... Sean McDermott explains his reasoning for coaching staff changes. ... UB QB Tyree Jackson has a chance to be one of the top 100 players drafted.